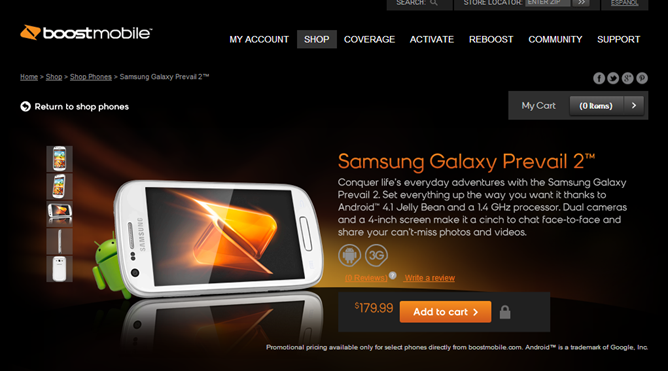 Anyone looking for an affordable handset might want to take notice of the Samsung Galaxy Prevail II available today from Boost Mobile. The device comes with Android 4.1.2, a 4-inch screen, a 800 by 480 resolution, and a 1750 mAh battery. A 5MP camera is embed in the back and the typical 1.3MP camera can be found in the front. The device will set you back just $180, and it comes without a burdensome two year contract. If you prefer for your phone to be waterproof, Sprint and Boost both now offer the Kyocera Hydro Edge. It's a rugged little thing, but like every other handset Kyocera makes, it's not the most impressive performer. Still, it's powered by a 1GHz dual-core Snapdragon processor, a significant step up from last year's model. Like the Prevail II, it comes with Android 4.1, a 4-inch screen, and a 5MP camera on the back. Boost Mobile will part with it for just $149, and it's available now. Sprint customers can get it for $19 (after a $50 mail-in rebate) with a two-year contract, but it's not yet on the site. Give it a bit. 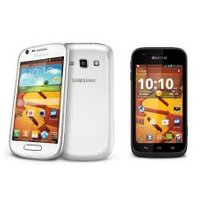 Boost Mobile is today announcing the availability of the white Samsung Galaxy Prevail® II priced at $179.99. Samsung Galaxy Prevail II with AndroidTM 4.1.2, Jelly Bean, makes for a powerful, customized consumer experience. The large 4-inch screen with a 5-megapixel rear-facing camera and a 1.3-megapixel front-facing camera allows for face-to-face chatting and the easy sharing of pictures and videos. Under $180, the Galaxy Prevail II is affordable for those consumers who want a premium Android smartphone experience at a real value. Samsung Galaxy Prevail II can be paired with Boost Mobile’s no annual contract $55 Android Monthly Unlimited plan with Shrinking Payments. For every six on-time payments, the cost of Boost Mobile’s Monthly Unlimited plan shrinks by $5, eventually getting down to as low as $40 a month for unlimited nationwide talk, text and picture messaging, Web, email and calls to 411. Payments do not need to be consecutive to qualify for the next savings milestone. Samsung Galaxy Prevail II is available now at Boost Mobile’s exclusive retail stores, select independent wireless dealer locations nationwide and at www.boostmobile.com/prevail2 with free shipping. OVERLAND PARK, Kan. – July 11, 2013 – Sprint (NYSE:S) will offer the submersible Kyocera Hydro Edge beginning on Friday, July 19, and Boost Mobile will offer the device starting Tuesday, July 23, without a contract. Kyocera Hydro Edge, which can be submerged in up to 3.28 feet of water for up to 30 minutes, is part of the new Hydro series of waterproof Android smartphones and builds on the popular Kyocera Hydro, which has been a top seller at Boost Mobile since its launch in August 2012. Sprint customers will benefit from days at the beach filled with pictures, videos and posts without worrying about overages thanks to Truly UnlimitedSM data, text and calling to any mobile phone with no metering, no throttling, and no overages, all while on the Sprint network. Hydro Edge will be available for just $19.99 (excluding taxes) with a new line or eligible upgrade and two-year service agreement after a $50 mail-in-rebate via reward card1 in all Sprint retail channels, including Web Sales (www.sprint.com) and Telesales (1-800-SPRINT1). Boost Mobile customers who choose to pair their device with a no-annual-contract2 option will benefit from Boost Mobile’s $55 Android Monthly Unlimited plan with Shrinking Payments. For every six on-time payments, the cost of Boost Mobile’s Monthly Unlimited plan shrinks by $5, eventually getting down as low as $40 a month for unlimited nationwide talk, text and picture messaging, Web3, email and calls to 411. Payments do not need to be consecutive to qualify for the next savings milestone. Hydro Edge will be available from Boost Mobile for $149.99 (excluding taxes) at Boost Mobile’s exclusive retail stores, select independent wireless dealer locations nationwide and www.boostmobile.com with free shipping. It will be available in early August at select Boost Mobile national retail locations. 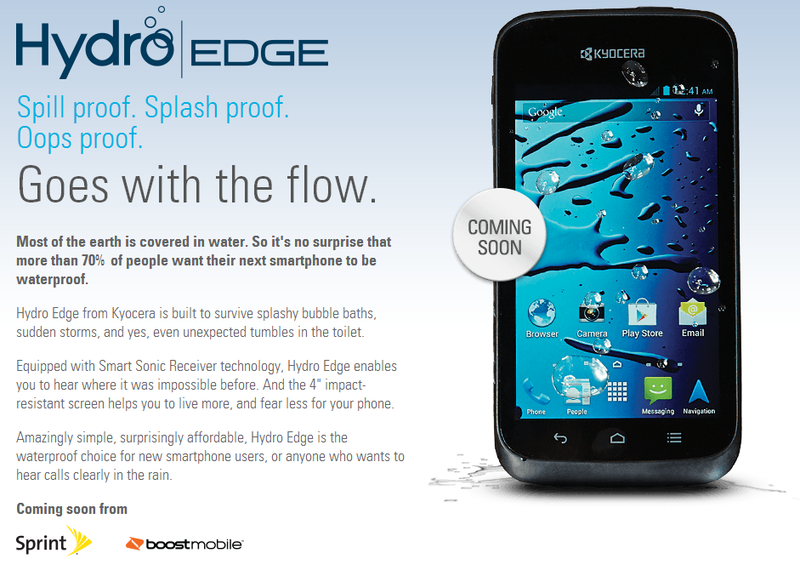 Boost Mobile is offering Hydro Edge for pre-order starting today at www.boostmobile.com/hydroedge. This marks the first time a device has been offered to Boost Mobile customers through pre-order. “We're continuing to see growing demand for waterproof phones that can survive the accidents life throws at us," said Eric Anderson, senior vice president and general manager of global sales and marketing at Kyocera Communications Inc. "Hydro Edge builds on the success of the original Kyocera Hydro and adds some great extra features, such as Smart Sonic Receiver, to make a very attractive, affordable Android smartphone. It's a must-have device for staying connected while lying around the pool or going to the beach this summer." To support the growing need for data, Sprint is rolling out a new 3G/4G network designed to provide faster data speeds, improved call quality and easier connectivity. Sprint expects customers to benefit with better wireless signal strength, in-building coverage and fewer drops/blocks. For the most up-to-date information on Sprint network coverage, please visit sprint.com/coverage. Please visit kyocerasmartphones.com/hydro-edge for more information.